These easy garlic dill pickles are a refrigerator pickle with no processing. 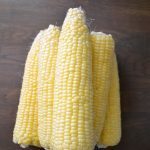 They stay crisp for up to a year and are a quick way to keep your harvest. They take less time. I can finish a quart in about 20 minutes. 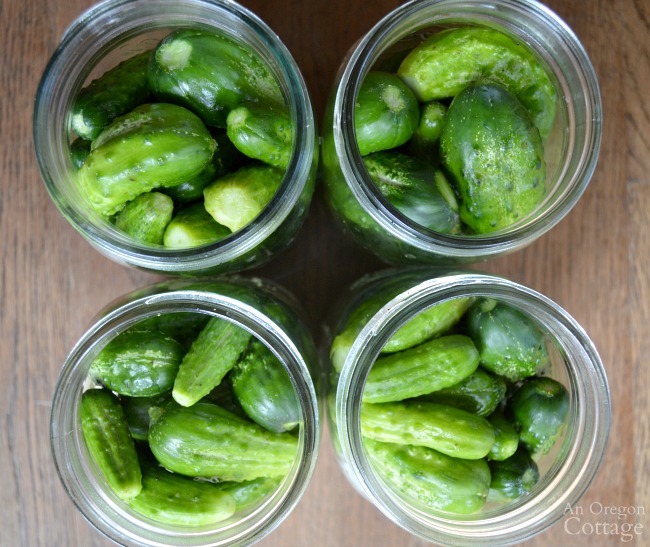 If you’re growing the cucumbers, you can do 1 or 2 quarts at a time as they ripen. 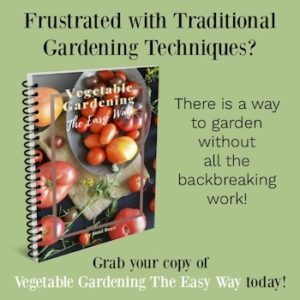 This is especially good for small gardens that can only fit a few cucumber plants and would never have enough for a full canner load. There’s no heating the house with a canner on the stove during the height of summer (it’s 104 in the shade at my house today!). 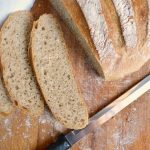 The recipe can be altered with seasonings and garlic without the risk of food poisoning that comes with playing around with recipes for water-bath canners. 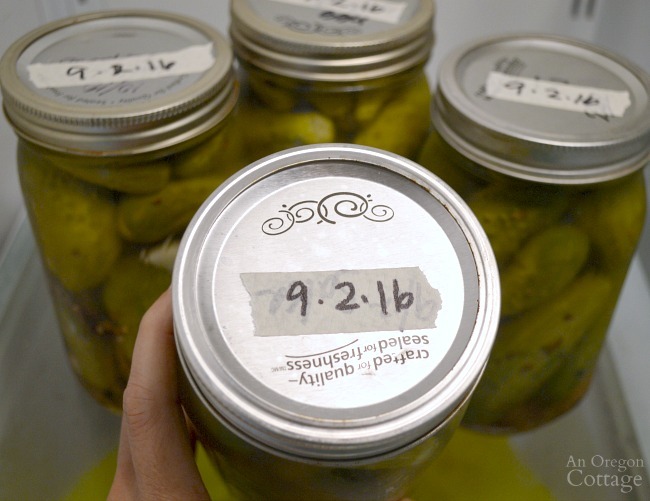 Here’s an important safety note about homecanned pickles: I know there are some people that “can” their pickles this way all the time, just letting the heat from the vinegar mixture “seal” the jars (a process known as “open kettle” canning) before storing them on a shelf without any water-bath canning. I know that people have done this for many years in some cases and that “nothing has happened” in their experience. I hear and read this all.the.time. However, the USDA says that this practice is not secure and that there is a danger of food poisoning as well as spoilage. 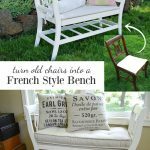 Here’s a good article on the subject. And my take on it is this: IF the rare occurrence did in fact happen with one of my home-canned foods, would it be worth it? What about if it might cause intestinal problems? My answer is NO- it’s only food and never worth sickness (or a life, heaven forbid) and I will never even take that chance, especially when it’s so easy to take the recommended precautions. 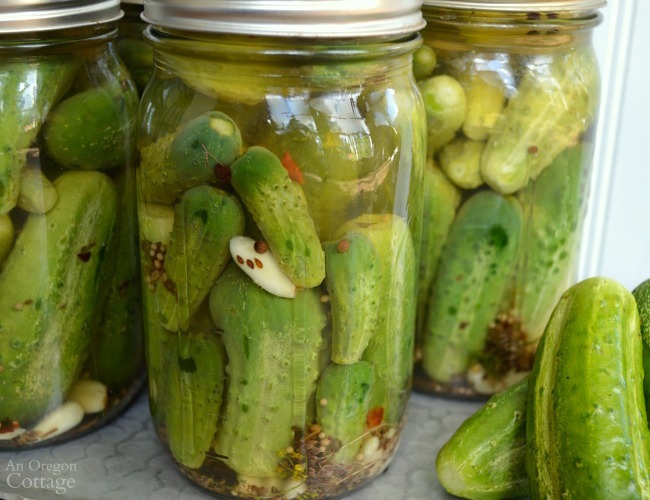 So, off my soapbox and onto our fully refrigerated pickles! Enough cucumbers to fill a quart jar, minimum. 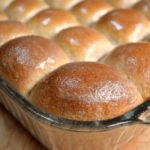 You can multiply the recipe for however many jars you can make. Plastic canning storage lids or metal lids and bands: this is a time it’s okay to reuse old canning lids since they are not actually sealed for refrigerator storage (to ensure proper seals in fully canned products always use new lids- this is not the area to scrimp- your time is worth it). Metal canning funnel (my preference since we’re pouring in a hot brine) or plastic canning funnel. 1. 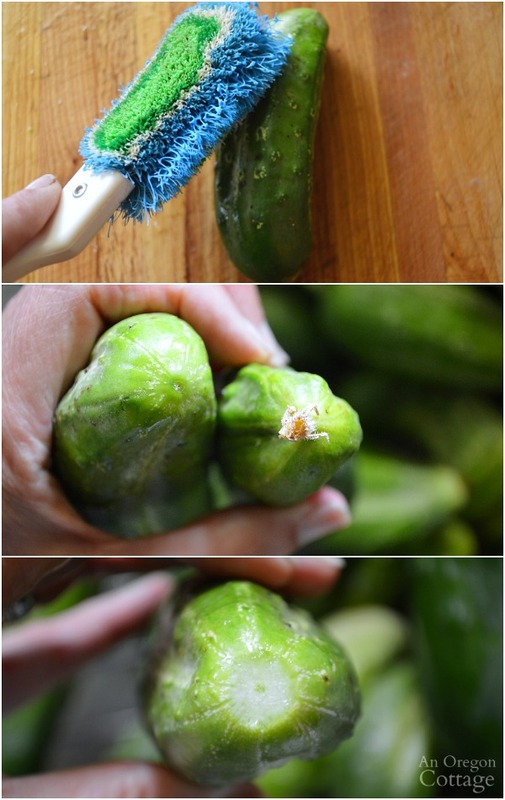 Scrub the cucumbers well. My favorite pickles are from the smallest “baby” cucumbers and it’s the main reason I grow my own. I used to pay a lot for “baby” pickles in the store after realizing that I couldn’t pick out only the little cucumbers at farms. Yeah, for some reason they frowned on that. 2. Find the blossom end of the cucumbers. That would be the end that doesn’t have the stem where it attached to the vine. (You may laugh, but I had to learn these things!) Apparently, there’s a wicked enzyme here in this little end that will turn your pickles to a soft, NOT CRISP, pickle. And since we’re making this recipe in order to get a crisp pickle, let’s not cut this corner, OK? 3. Just cut a little off. We do not want pickles with sawed-off ends. This I tell you from experience (hey, if a little’s good, then a lot’s great, right?). 4. Repeat with all your cucumbers. Tip: When dealing with a larger amount of cucumbers (for 3 or more jars) I separate the cucumbers into 3 piles by size: large, medium, and small. Then it’s easy to fill the jars with the larger cucumbers, then medium and ending with the baby size. 1. 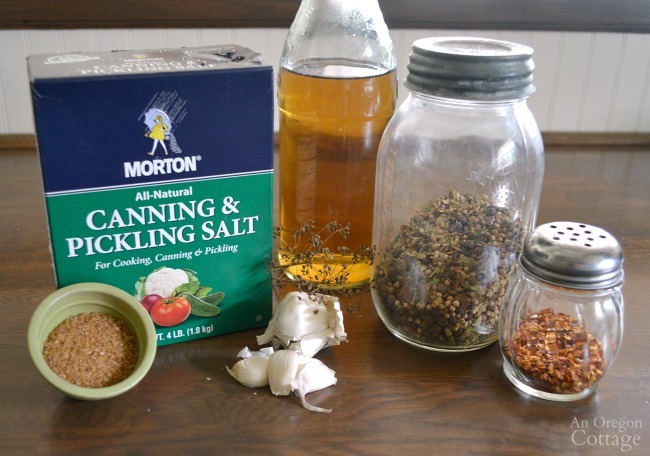 Fill each clean jar with: four cloves of garlic, sliced in half to release all the garlicky goodness, 1-2 heads of dill (if you’d like even more dill flavor you can add a teaspoon of dried dill seed as well), and red pepper flakes. The pepper flakes are optional, but really add to the flavor. You can try everything from a few shakes to 1/2 of a teaspoon for each jar, depending on the spiciness level you’d like to achieve. 2. Pack the cucumbers into the jars, right on top of the other ingredients. 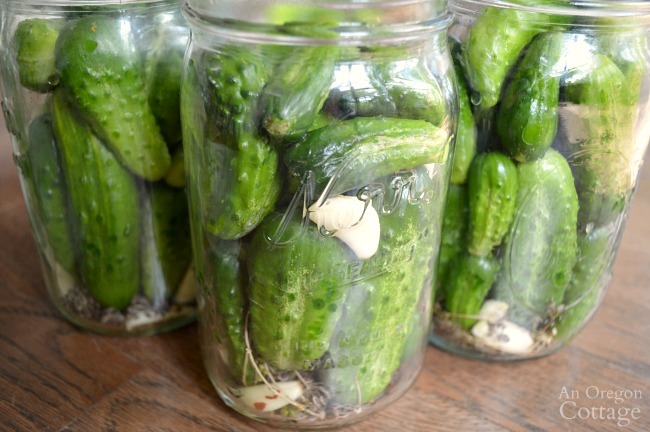 You can pack them as tight as you can, but allow enough room at the top for the brine to cover all the cucumbers. 3. Add vinegar and water to a large saucepan along with pickling spice, pickling salt, and sugar. Bring to a boil, reduce the heat and simmer for 5 minutes. 4. 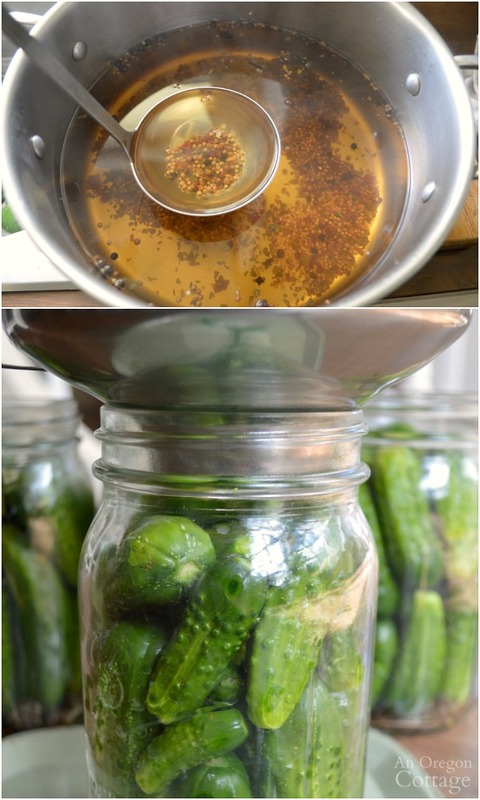 Pour the hot brine into the jar(s) using a canning funnel and ladle. Fill to cover the cucumbers, leaving about 1/4″ head space (the space between where the brine stops and the very top of the jar rim). Since these will be stored in the fridge, we don’t have to be quite so particular about the head space. Anything that covers your cucumbers, but doesn’t touch the lid is okay. 5. Label the lid with the day as well as the month and year. You will need to let these “cure” in the refrigerator about 3 to 4 weeks before they’ve pickled enough to eat, so you will want to have the day that you made them on the label. I think they are best after a whole month, so usually we wait that long at least, and they will continue to improve over the months in storage. 6. Store in the refrigerator. 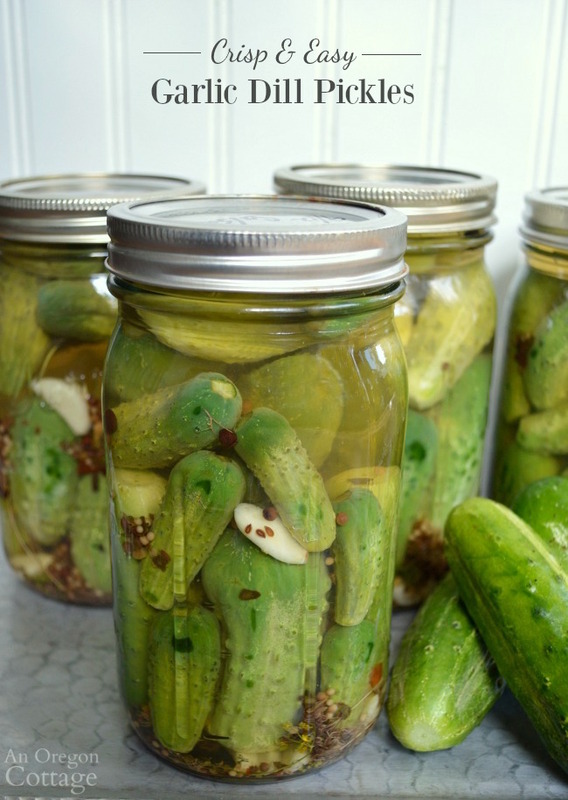 I think they are best after a month, so usually we wait that long at least to eat the first pickles, and they will continue to improve over the months in storage. That’s it – you’ve just made the BEST dill pickles you will ever eat! I make enough quarts with our summer harvest of cucumbers to last us until the following summer (12-13 for our family) and have had no problems with them storing in the fridge for that length of time. We’ve eaten them at a year-and-a-half, too, and they’re still great. Click the arrow for the printable garlic-dill pickles recipe with all the measurements & steps! 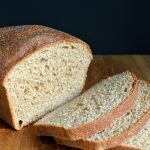 I found your recipe and decided to give it a go. My first time making pickles. I got tired of lugging home huge jars of crappy pickles for the kids. I reused a Vlassic pickle jar and followed the recipe faithfully. I had to stop myself a few times from opening that jar before a month had passed to sneak a taste. Finally, the day has arrived. 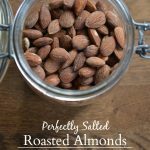 I think they are really good (and crunchy!) but my family thinks they are too sour. They are way more intense than store bought pickles. 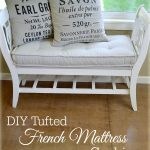 So, how would you suggest backing off the tartness? Can I use less vinegar? Would they mellow out in the fridge after a few more weeks if left alone? 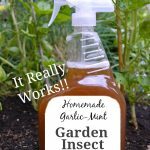 First – did you use all apple cider vinegar or distilled white? Apple cider vinegar is milder so I use that exclusively with pickles. Second – you can add more sugar. Start by doubling the amount and taste the brine. You can also make jars with varying amounts to find what your family prefers. Third – you can also decrease the vinegar to 1 cup and increase the water to 2 cups. Since these are being canned, it’s fine to adjust any part of the recipe to your tastes and still be safe. Sounds good, but you didn’t give amounts of each ingredient? What is the water to vinegar ratio? How much salt? Click the arrows to go to the full recipe (at the top of the page and the bottom). These pickles look delicious. 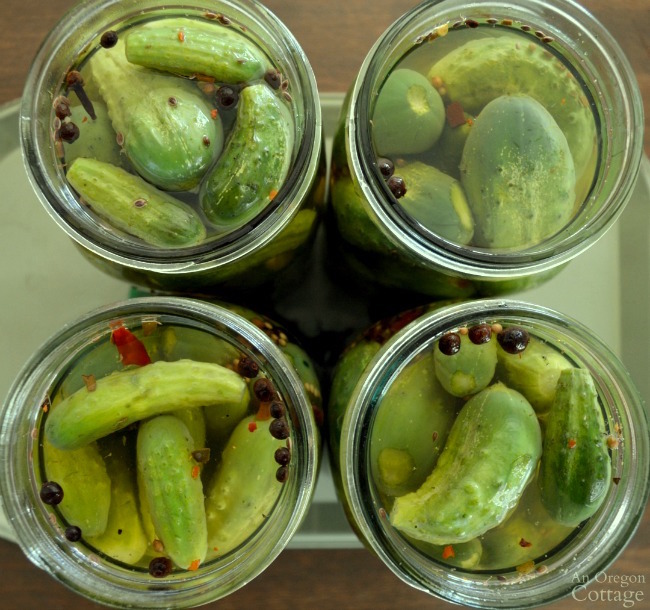 I prefer making refrigerator dill pickles too…they definitely do end up being more crisp! Amazing!! Been looking for a non canning recipet for a while. Got a small batch of cucumbers this year and tried this with my first one. I had 4 friends over and they said best pickles they ever had. Thanks!! I don’t have a lot of refrigerator space so I make mine in a gallon jar .after 3 weeks of sitting in the frig can I then can them in a water bath so I can make more and keep them on a shelf. Oh, well I use to can these all the time, we just prefer them crisp from the fridge. Can I ask why you fridge them first and then can?